Welcome. 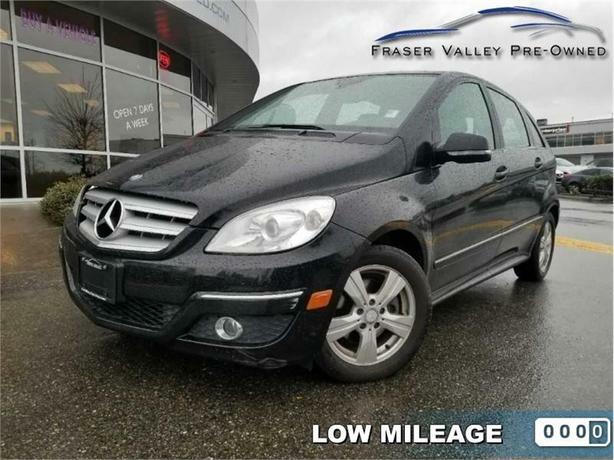 This 2010 Mercedes Benz B-Class is for sale today in Abbotsford. The B-Class displays a unique exterior design, though with the distinct look of a Mercedes with a sporty flair. Inside, typical features found in B-Class trims available in Canada and Europe include premium cloth upholstery, 60/40 split-folding rear seats, a multifunction steering wheel, an assisted steering system, air conditioning, and a six-speaker audio system with a 6-CD changer and Bluetooth. This vehicle is very versatile and roomy for four adults or can pack in loads of stuff. This low mileage hatchback has just 61092 kms. It's black in colour. It has a 5 speed manual transmission and is powered by a 134HP 2.0L 4 Cylinder Engine. Buy this vehicle now for the lowest bi-weekly payment of $78.63 with $0 down for 60 months @ 5.69% APR O.A.C. ( Plus applicable taxes - Plus applicable fees ). See dealer for details.